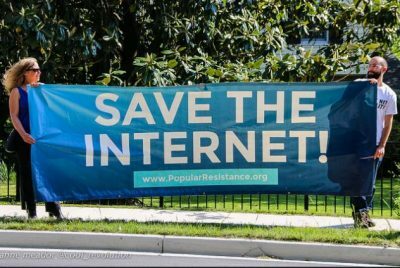 Internet activists, major web companies, online forums, and small businesses are preparing to “go red” as part of a Red Alert for Net Neutrality campaign to drive constituent calls and emails to lawmakers ahead of an imminent Senate vote to overrule the FCC’s overwhelmingly unpopular repeal of net neutrality. The online push will begin on May 9th when the Congressional Review Act (CRA) resolution will be officially discharged, and will carry through until the vote. The protest was just announced, but already Etsy, Tumblr, Postmates, Foursquare, Twilio, Private Internet Access, and Gandi.net have said they plan to participate. Thousands of other large and small websites are expected to join. Behind the push are Demand Progress, Fight for the Future, and Free Press Action Fund, the groups that run BattleForTheNet.com and have been responsible for the largest online protests in history. They’ve helped drive millions of phone calls, emails, and tweets to lawmakers in recent years. The CRA lets just 30 senators force a vote to overturn a recently-issued federal agency rule. On May 9th, senators will present a petition to force a vote on a resolution that would undo the FCC’s net neutrality rollback. If the resolution passes into law, it will restore the strong net neutrality protections that were put in place in 2015. All 49 members of the Democratic Caucus, as well as Republican Susan Collins, have announced their support for the effort – meaning that, at most, just one more vote is needed to ensure passage in the Senate, at which point Internet activists plan to take the fight to the House.